The parade lap, which takes place on Monday 25th August, is part of the Classic TT Races presented by Bennetts that includes a tribute lap to road racing legend Joey Dunlop and the Bennetts 500cc, Motorsport Merchandise Formula 1 and F2 and the Okells 350cc Classic TT Races. The 1992 Senior TT is widely recognised as the greatest race in the TT's history. It saw Hislop swap the lead with Carl Fogarty throughout the six-lap race before the Scot eventually won just 4.4 seconds ahead of the Blackburn rider. Fogarty had the consolation of setting the outright lap record with 122.61mph, a record that was only broken seven year's later, but Hislop also set the race record with 121.8mph. "It will be an incredible honour to ride the bike on the circuit that it is most associated with. 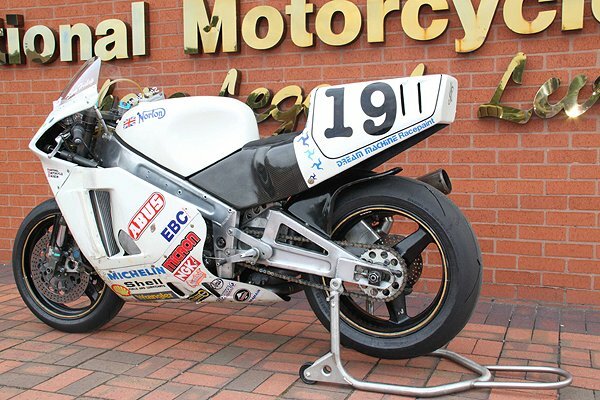 We are keen that some of the museum's most valued machines are seen by fans in the appropriate context of live displays rather than just at the museum itself and we are delighted to be associated with the Isle of Man Classic TT event." Steve Hislop on the Norton NRS588 at the 1992 TT.